One type of questions that the Korean receives frequently is questions about traveling in Korea. The Korean's standard answer is -- go buy a travel book. Most travel books about Korea do a fairly good job about introducing the country and giving the basics of how to get around. And unless you are planning to stay in Korea for several months, there is very little chance that you would exhaust the sights and destinations given in a travel book. And if a travel book does not work for you, there are many, many websites and blogs that are run by people who do this stuff for a living. But just because the Korean has been receiving so many of these questions, he figured he should have a post about traveling in Korea. The Korean will make this post an "open question post" -- that is, he will accept questions from the comments section below, and update the post with answers. He will also post good answers and recommendations from the comments. To start off, here are some basic stuff about traveling in Korea. Where should I stay in Seoul? Most tourist attractions are clustered around the center of the city, but a hotel room in the central city can get pricey. If you are budget-conscious, feel free to stay toward the outer edges of the city, as Seoul is covered with excellent public transportation. But be mindful that Seoul is a very large city area-wise -- you could easily travel an hour and a half on a subway, and still remain in Seoul. Are there any dangerous areas in Seoul or Korea? Korea is safer than the U.S. and Europe in terms of crime, but it is hardly crime-free. In Korea, as are in everywhere else in the world, tourists are an easy target. 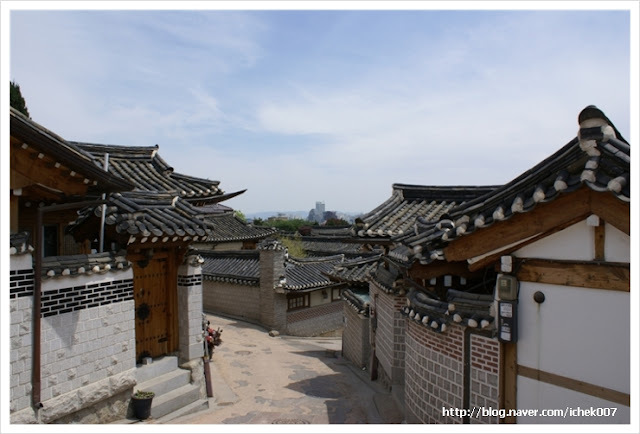 There are certainly bad areas in Seoul or any Korean city, but if you are an ordinary tourist looking for sights, there is no reason for you to be there either. Use your ordinary precautions. You can actually get the best rate from ATM machines that accept foreign cards. The easiest one to identify is a Citibank ATM, which is fairly common in large cities. What happens if I get lost? Do Koreans speak English? Most Koreans speak decent enough English to give directions. When in doubt, ask professional-looking people or students, who are more likely to speak English. Where is the Korean's favorite place in Seoul? Bukchon. It looks like this. More questions will be answered as they come in, after the jump. From birdscout: I remember reading in a previous post that whenever you travel to Korea you buy your underwear there (Korea has the best nae-bok/cotton underthings!). Where do you shop? The "best" place -- as in, a place that is worth visiting as a destination -- is probably Dongdaemun Market, a large outdoor wholesale market in Seoul. But personally for the Korean, he simply picks them up wherever he sees them, because underwear and socks do not have to be in such high quality. Korea's street address system is a confusing jumble -- even Koreans themselves have a difficult time finding a certain place just with an address. Hence, there will be a massive overhaul of the address system next year. It will help in the long term, but it will only add to the confusion in the short term. The Korean has found that searching Naver.com tends to give the most accurate address and public transit information. Of course, the downside of this is that you will need to be able to read and type Korean. In a pinch, the surest place to ask is a nearby real estate agent's office, because they are the people who are most familiar with any given neighborhood. Also, check out many helpful tips provided in the comment section. A good start. I'd be happy to take on any other questions as well, since I live in Korea and work with TBS, Arirang, and the Ministry of Sports, Culture and Tourism. Regarding traveling in Korea, one of the best resources is the 1330 line. It operates 24/7 and can give assistance in Korean, English, Chinese, and Japanese. It provides transportation, tourism, and basic translation assistance. What and stay in hostels and hotels frequented by travel book users therefore meeting the people you'd meet at home? If you do that then why bother going? Lonely Planet is awful. It recommends Kim's hostel around Suwon or something. 3 stops from Hong Ik. Problem is this gave Kim a licence to print money, to raise her prices significantly and to reduce the quality of her accomodation. Same with many restaurants and attractions. My own person advice is simply to go exploring, granted I spent over 2 months in Korea and had my own transport (it is quite cheap to fly a motorbike into Icheon £500 will do it). Don't be afraid approach people talk to them and travel around, Korean night buses can get you anywhere. Go off the beaten track. S Korea is safe there is no danger of being mugged or murdered. Seoul probably has a higher chance of this. During my time I discovered a massive shanty town, and had some incredibly memorable nights drinking with Korean homeless people. Found enormous numbers of pink light districts all over the place. Found mountain trails, found a ship atop of a mountain (its a fake hotel). Found untouched beaches with blue within blue water so clear you'd swear it was a photoshop. Microrestaurants run by old people out of their living rooms (granted I could have just barged into somebody's home). Camped out on riverbanks following the rivers to their source. And generally went drinking and eating with normal everyday Koreans unused to seeing tourists. Used Jinjilbang to wash and sleep sometimes. Most westerners get 30-60 days and you want to follow an instruction book like a crappy super market cake mix? I have to respectfully disagree with the advice about getting the best exchange rate at an ATM. I have lived in Korea on and off for 14 years total (starting in the 1980s) and my income has always been in US dollars - so I am very familiar with exchanging money. The very best exchange rates I have ever received are with the old ladies at NamDaeMun Market. Seriously. They literally sit on their money - keeping it inside some kind of container that they sit on. I suppose since they have zero overhead costs - they can offer the best exchange rates. There are numerous money exchange offices around Seoul - and they are the second best place to exchange money. But you need to find the one that has the best rates. You will always get a higher exchange rate for $100 bills (5 more won per dollar - compared to $20s and $50s). In my experience - the exchange rate at an ATM is consistently lower than the two options above. Hotels all offer exchange services - but they tend to be on par with the rate you get at an ATM. Having said all this - if you're only exchanging a few hundred dollars - and you're staying at a hotel or an ATM is located close by - it's probably not worth your trouble going elsewhere (unless an exchange office is also located close by) because the difference for that amount of money will only be a dollar or so. I remember reading in a previous post that whenever you travel to Korea you buy your underwear there (Korea has the best nae-bok/cotton underthings!). Where do you shop? I dunno I bought three grey and two red T shirts in Dongdeamun Market and got a lot of change out of a 10,000 Won note. Because I remember going across the road for noodles made in front of me. They apparently say made in korea. 3 years on after being used as gym T shirts they are still in very good condition. Unlike the crap I buy from UK shops which is made in Bangladesh or China which falls apart after a week or two. In my travels around Korea, I have just used Motels, cheap clean, and only booked one once (Yeosu Expo). Just learn the letters in Korean for Motel (and about half have signs saying Motel) and find the nearest bus station, and you are sorted. Even if you know no Korean they will kindly write the price on a piece of paper. Bus stations are easy to use. And cheap. 1 Learn Korean Characters for your destination, find times and price on the boards there. 2. Go to window, say place (or write) pay money. 3. Go to platform. Your ticket will show this. (Some small bus stations may not have numbered platforms, in that case look for signs on the bus/bus station). Some places will have English Signs as well for place names. 4. Seats are allocated so remember your seat number. I could say a lot here, but I'll just comment as to where to stay in Seoul, or anywhere in Korea. There is a huge couchsurfing.com network and Airbnb.com and Wimdu.com are growing everyday. You could stay in some boring, hotel that is probably pretty much the same as any other hotel anywhere in the world, or you could stay with local people and get to know about the real Seoul. For people who want to experience what life is really like in Seoul, I think any of those three options are much better than any hotel can offer. Plus it will probably save you some won, too. Seoul Backpackers or Namsan Guesthouse! Cheap, clean and so accessible! "What happens if I get lost? Do Koreans speak English? Most Koreans speak decent enough English to give directions. When in doubt, ask professional-looking people or students, who are more likely to speak English." True. They speak decent enough. But they're too shy to proove it, so they might just run away or get all lost and stutter. It really depends who you run into. But it's always good to give it a try. I lived in Seoul recently for about 2 years and loved it. To have a more authetic experience of the city, I highly recommend getting off the sparkly clean main streets and start exploring the alley ways. The alleys are full of quirky (and inexpensive) restaurants. Dac- I actually had the opposite of someone running away. I was waiting for a friend in the subway station, so I was checking out the map at the exit, and a guy came up and asked if I needed help. He sounded terribly concerned about it, too, I sort of feel bad for disappointing him! I have had such experiences too, Stephanie. A lot of them. This is why I said "depends who you run into". But mainly you can know what to expect by their face expressions, that works in every country. Guitard is right about exchanging money @ markets, DongDaeMun & NamDaemun. The ladies there will give you the best rates anywhere. You'll find some at ITaeWon too. DDM & NDM are great for inexpensive bargains. You can spend days @ either & still not see everything. Don't stay at the Catz hotel in ShinSaDong. I found them through Expedia but upon arrival we found that it's just a F'ing YeoGwan(Love hotel). Poorly lit, drains are clogged, dried sperm on furniture. The beds were really comfortable though. If you have the $ stay at a name brand hotel. Food, drink, shopping are all cheap so spend the money on your accomodations. Nothing beats coming back to a clean, refreshing room w/ a kickass A/C & shower after a long day of activities. My advice...Don't be an all too common, condescending, narrow-minded, ahole, American traveler and you will find us standoffish, judgemental Koreans to be extremely warm people. sucked. It really helped me out, hopefully it'll be useful for those of you who are traveling to Korea. G'luck! "Where is the Korean's favorite place in Seoul?" If you happen to have an acquaintance in Korea: GREAT! Makes the visit much better. If you have a good relationship with that friend (or in whatever "relationship" you are) you will get to see places you won't find in a book. Insider-tips! Something that might help: If you are someone who dreams about visiting a country for ages and have set your mind on making it true (whenever), you could think about a penpal friendship first. When you finally visit the country it can make a lot of things easier. But: I have to warn you. Ever tried to keep in touch with penpals for a long time? It's like looking for the needle in the haystack. Until you find that person, you maybe have tried 25+ other penpal friendship that went to a waste in no time. ahnjoe, Was your iPhone purchased in the US? I've been reasearching and many folks (including me when I was in Seoul) could not get our phones to connect. Has to do with Korea having each phone registered on the system with a IMEI registration number, that you can only get with a phone purchased in Korea. So, did your apps still work while there? Were you paying roaming charges? Were you in airplane mode and using free wifi to connect? Thanks! Nighttime is always a dangerous place no matter where you go. I'm a girl and all of my female Korean friends keep emphasizing that I shouldn't go out at night unless I have a clear purpose and destination. Long-time lurker, first time poster, a massively tragic fan of Korean food, history, trains and language. Love your work, TK. I'm intending to visit Korea to celebrate my graduation next year. I'm also what you might call a "spatial navigator" -- I like to plan my trips using maps; I love to explore cities using nothing but a street directory, just walking around randomly exploring different neighbourhoods or catching random bus routes and seeing where I end up. The thing is, I can't seem to find any resources in travel books or online about what street atlases are available or where to buy them. I have a 1:50,000 road atlas of all of South Korea published by Yeongjin, but it's massive (several kilograms at least and nearly 700 pages), far too heavy to carry around with me, and doesn't show cities at street-level detail. Then there's the unfamiliar (to Westerners, anyway) addressing system prevailing in South Korea, where many minor streets are un-named and addresses are based on block numbers which are assigned randomly. Even Google Maps doesn't show the block numbers when you zoom in. So if I want to find a nice little restaurant at, say, Jongno-gu Sungin-dong 75-23 (hypothetical address), I'll need a map that shows the block numbers. Most people in Seoul seemed to use their smartphone mapping apps. We found a pocket street atlas at the Kyobo books store near Jonggak station. 1:10,000 scale, published in 2010 by Sjmap. this is it, listed on amazon at a ridiculous price. we paid 15,000 won. I was in Buchon few months back when I traveled to Seoul and really, it was huge, it was impressive, I really loved that. How to say the very basic and important: "I'm lost (cold and hungry). Can you please help me?" I only had a short stay in Korea but I had no problems with language. Because I went mainly to tourist attractions, there were so many American or Canadian Koreans around and they were only too happy to do some basic translating for me. One lovely guy even gave me 1000 won for the bus because I had no change. Also, if you are travelling before the end of the year, check out http://english.visitkoreayear.com/english/benefit/benefit_07_01_01.asp and you can get a free bus trip to Busan or Jeonju. Whether you are paying your cleaners or maintenance staff for your holiday let or transferring money to your overseas bank account this product offer you great value and is FEE FREE for transactions in excess of £2,000 and only £5 per transfer for payments below that amount. I'm planning to go to South Korea in may or early June, 2013. I'm traveling alone. First time so I don't know anything! Anyone going to South Korea next year around may or June?